This song is a parody of the Christmas classic, "Santa Baby". Written by Karmann Powell and performed by Karmann and Kompany. Karmann Powell vocals, Joe Brokaw bass, Joe Stolpa lead guitar, Darrell Stackhouse drums, Stan Powell, sound engineer. 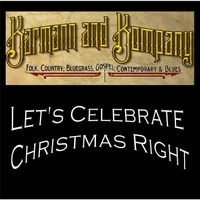 Karmann and Kompany is an award-winning band led by singer/songwriter, Karmann Powell. Joining her is Joe Brokaw on the bass, Joe Stolpa on lead guitar, and Darrell Stackhouse on drums. The band features a clean, clear sound with powerful female vocals and a fun, enjoyable stage presence. Song selections range from folk, country, gospel, bluegrass, blues and original compositions, with ukelele songs thrown into the mix, for good measure.